Posted in Research News on January 11, 2016 by NSSL Webmaster. Available on any smart phone, the mPING app allows users to quickly and anonymously report weather at their current location. 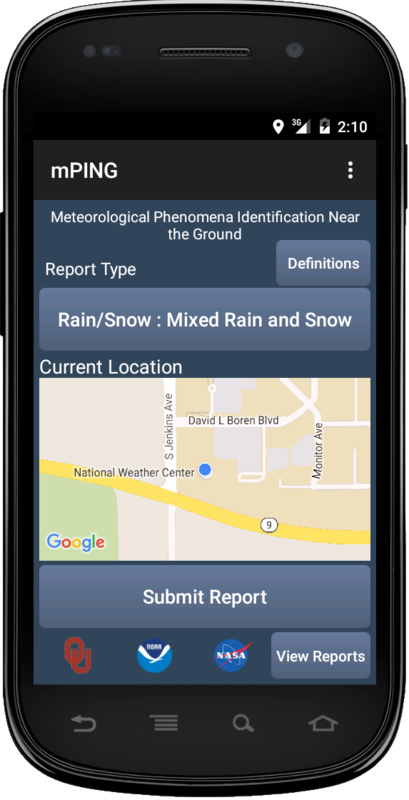 Citizen scientists around the world, not just those in the United States, can now submit weather observations and view reports on the go using the newly upgraded mPING smart phone application. 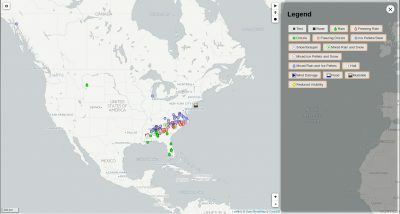 Developers from NOAA’s National Severe Storms Laboratory and the University of Oklahoma’s Cooperative Institute for Mesoscale Meteorological Studies announced the app’s expanded reach and utility Monday during the American Meteorological Society’s annual meeting in New Orleans. 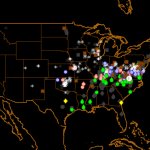 Since its launch in December 2012, mPING (meteorological Phenomena Identification Near the Ground) has received nearly a million weather reports on U.S.-based weather events including rain, snow, ice, wind, hail, tornadoes, floods, landslides, fog and dust storms. These reports are used to improve forecasts related to road maintenance, aviation operations and public warnings. Now, users around the world and outside the continental U.S. can participate in mPING and see their reports. The updated interface is user-friendly and available globally. New features include multi-language support, with 11 languages currently available. Additionally, the app design has been refined for both iOS and Android devices, allowing for greater consistency and precision. 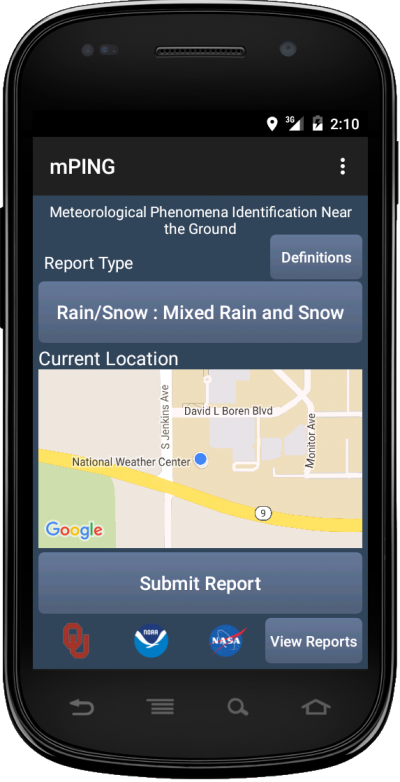 The mPING app allows users to share weather observations and view reports from anywhere in the world. Use of mPING data is expanding as well. 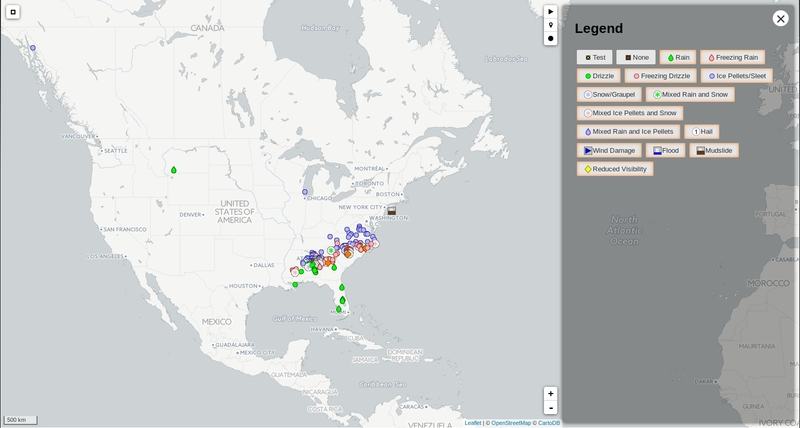 NOAA National Weather Service forecasters now have access to mPING observations on their office workstations. This means NWS forecasters will be able to overlay mPING reports with other data such as radar and satellite observations to aid them in their decision-making. The ability to submit and display in other, independent applications is now possible as well. Television stations and private weather companies have the opportunity to build the ability to submit and display mPING submissions in their own branded applications, making the information available to the public in new ways. “These are exciting times! The improvements make the app even more useful for researchers and forecasters as well as anyone who wants to know about the weather,” said Kim Elmore, CIMMS research scientist working at NSSL, who leads the project with CIMMS scientists Jeff Brogden and Zac Flamig. 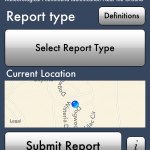 The mPING app has been cited as a successful example of citizen science. It was included in Scientific American’s list of “8 Apps That Turn Citizens into Scientists,” and the White House’s “Federal Citizen Science and Crowdsourcing Toolkit.” The official web page for mPING can be found here.